1. 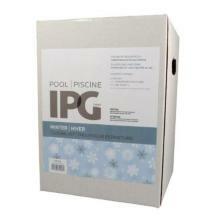 Remove pool cover and ice buffers (see note below). 2. Reinstall and/or close all drain plugs. Flush and drain all piping to waste. 3. Remove any surface stains and thoroughly clean away winter water line with AMAZE. 4. Reconnect chemical feeding equipment, if any. 5. Fill pool to normal operating level. 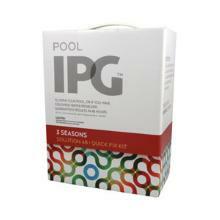 While pool is filling add in STAIN PREVENT to prevent staining, scaling or water discoloration. 6. Backwash and thoroughly clean filter with FILTER CLEANER (following directions on bottle), then put filter into operation. 7. With pump and filter operating broadcast OXY PRO over surface of pool. 8. Wait 12 hours then add in ALGIKILL 600 following directions on the bottle. 9. The next day test chlorine level. If level is between 1-2 ppm commence regular chlorine program, if under 1 ppm, shock pool. After operating pump and filter continuously for 48 to 72 hours, take a water sample to YOUR IPG DEALER for a complete WATER ANALYSIS. If necessary make adjustments to pH, ALKALINITY, HARDNESS and STABILIZER as recommended by your IPG DEALER. Allow pool water to filter continuously for first week backwashing and cleaning filter as required. Got a problem pool? 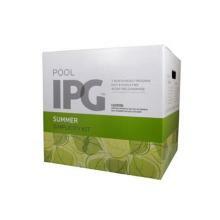 Clear your pool in 48 hours with a Solution 48 Kit, That’s a guarantee! This kit clears coloured water problems, filters out unwanted inorganic/organic particles and increases filtration capabilities of micro size particles. Make Life Simple with our Summer Simplicity Kit! 3 products 3 months supply 3 guaranteed results… ALGAE FREE GUARANTEE, cleaner water & simple pool care, all in a few minutes a week. All of the products are packaged so that pool owners do not have to physically come in direct contact with the chemicals. What else could you want? 2. Reinstall and/ or close all drain plugs ... Flush and drain all piping to waste. 7. With pump and filter operating broadcast ZAP over surface of pool. 8. Wait 12 hours then add in END ALGAE 15 following directions on the bottle. 9. The next day test chlorine level. If level is between 1-2 ppm begin regular chlorine program, if under 1 ppm, shock pool.